Less than 3 kilometres from our place, just past the end of Morrison Point Road, stands a particular reminder of the old Prince Edward County. Black River Memorial Chapel is no longer used for regular church services but is opened only for special events. It was closed by the United Church in 1967 about 130 years after the congregation was founded. It began in the 1830’s when revivals were sweeping the County and other parts of rural Ontario. Between 1830 and 1860 little Methodist congregations, with many of their new converts, formed all over the County. They were led by a combination of lay class leaders and circuit riding preachers on horseback, each of whom served a large number of small congregations over a very wide area. Little chapels were soon built every few miles; so many were needed because of the numbers of people who were wanting to attend and because of the difficulty of families travelling long distances by foot or by horseback to church. Gradually, as transportation improved, as rural populations began to decline and then, in the twentieth century, as church attendance declined, many of these little congregations were amalgamated and some of the chapels sold to serve as homes or barns or shops. 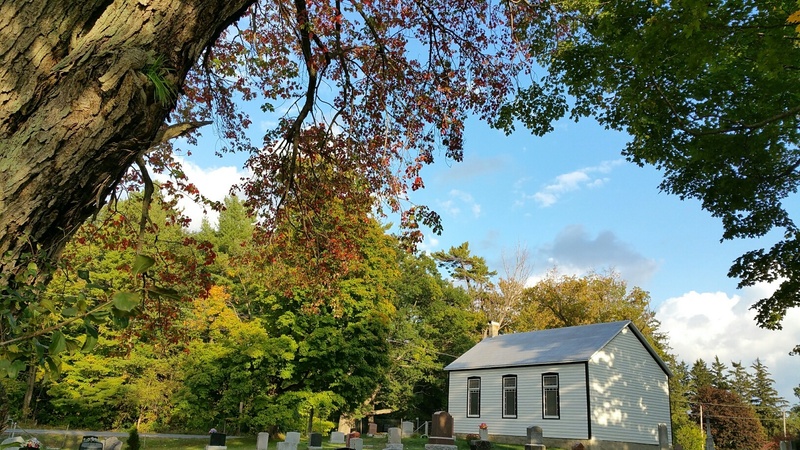 However, Black River Chapel, with its surrounding cemetery, was not sold but still remains as a reminder of that less secular period when rural Ontario was so deeply shaped by evangelical Protestant revivals. Sheila and I visited its grounds yesterday during a sunny break after several cloudy days. We took some pictures (actually, Sheila took most of the good ones) and thought that some of you might enjoy them. Black River Memorial Chapel and its cemetery. The church and cemetery are on a plot of land surrounded by a farm. 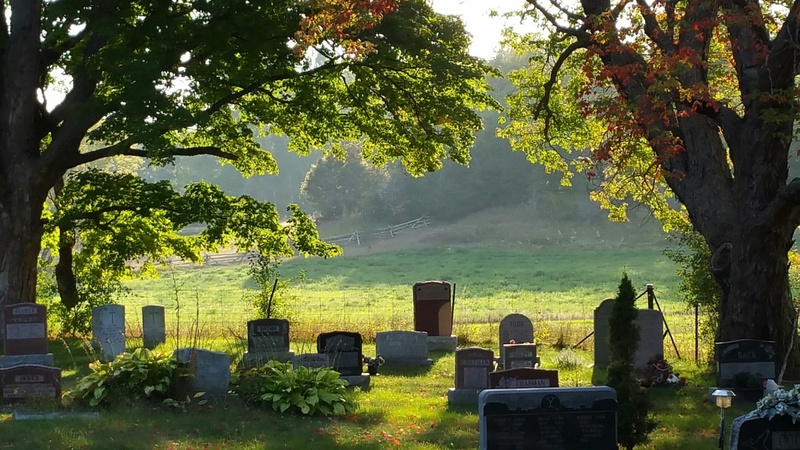 Although the church is no longer regularly used, the cemetery is still active. Doesn’t sound very good: I mean that burials are still taking place. We saw evidence of that today. Lovely. 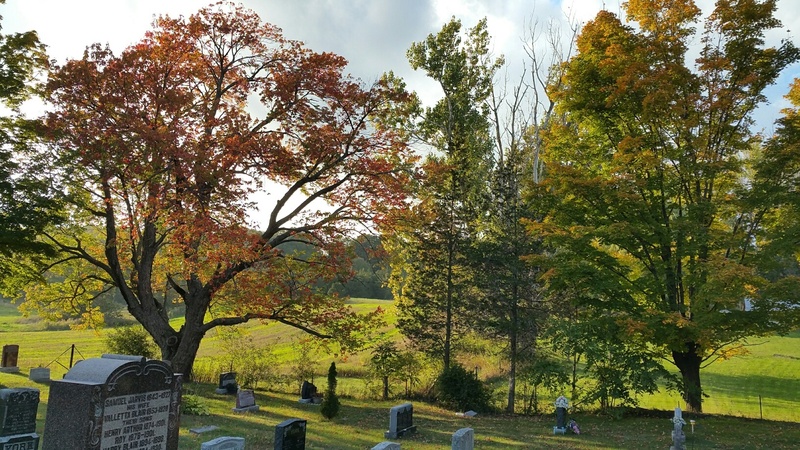 The photos of the cemetery in the fall sunshine remind me so much of the cemetery in Neustadt (Grey County) where I grew up and where my Dad is buried. It is a very peaceful and beautiful place. Thanks again for the photos and reminders of so many spectacular fall seasons in Ontario. Thank you, Jenny and Jayne. Today was another beautiful day and, even though we had a number of appointments and errands, we certainly enjoyed the crisp air and the sun on the foliage colours. Happy Thanksgiving!